Every study based only on the so-called proved reserves should be discarded as useless following the principle GIGO: Garbage In, Garbage Out. The term "creaming" (short for "creaming off") was coined in Shell Intnl. in the seventies when the work of Arps and Roberts (1958) and Drew (1974) became known. The idea is that the exploration process in a basin "creams off" the best prospects first, gradually having to consider more risky prospects. One could imagine that the large anticlines are so conspicuous that they are easier to find than the smaller more subtle closures. After that, fault traps against one fault and eventually more risky traps bounded by several faults would be drilled. In reality the process will be less organized, but in many basins the general trend is obvious. Cumulative volume discovered vs years on the horizontal axis. Cumulative number of discoveries vs number of exploration wells (slope is success rate). From a statistical point of view, the exploration process is a sampling without replacement from a finit population of exploration prospects. Without geology and geophysics this sampling may be random. However, even if the basin is drilled at random locations, the prospects with a larger 2-dimensional size have a slightly better chance to be found first. So even in that theoretical case there would be some creaming effect. The bias in the sampling will be still larger if geological insight, seismic and other surveys and geochemistry become involved. As the prospects portfolio becomes depleted we see that both the mean of and the variance of the population of the remaining prospects are decreasing. The part of the globe represented by this graph is "World Outside Communist Areas and North America". It is outdated in two respects: it was made in 1989 and the ultimate recoveries of the field discovered in say the last ten years of the graph will have changed. Nevertheless, there is considerable creaming. 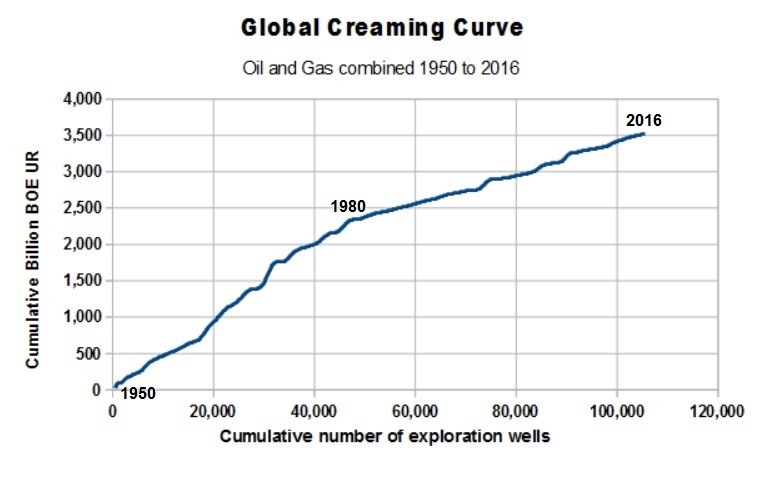 In a recent article by E.Smith Llimás (2017) in the AAPG Explorer, a graph of yearly number of new Field Wildcats drilled and yearly discovery of conventional oil and gas in terms of barrels oil equivalent (BOE). 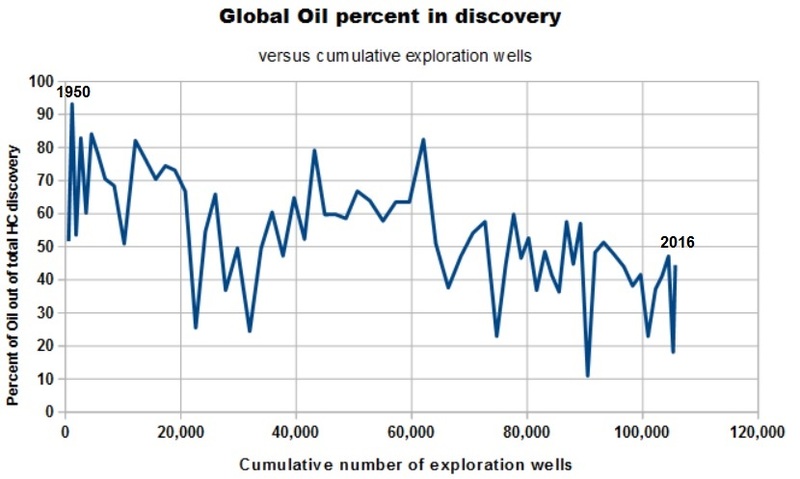 It shows that since 2008, both drilling and discovery volume has declined considerably, suggesting a rather gloomy situation for conventional oil and gas, which is true, of course, with regard to the exploration activity. However, both declines are mainly influenced by economics at low oilprices, not geology! 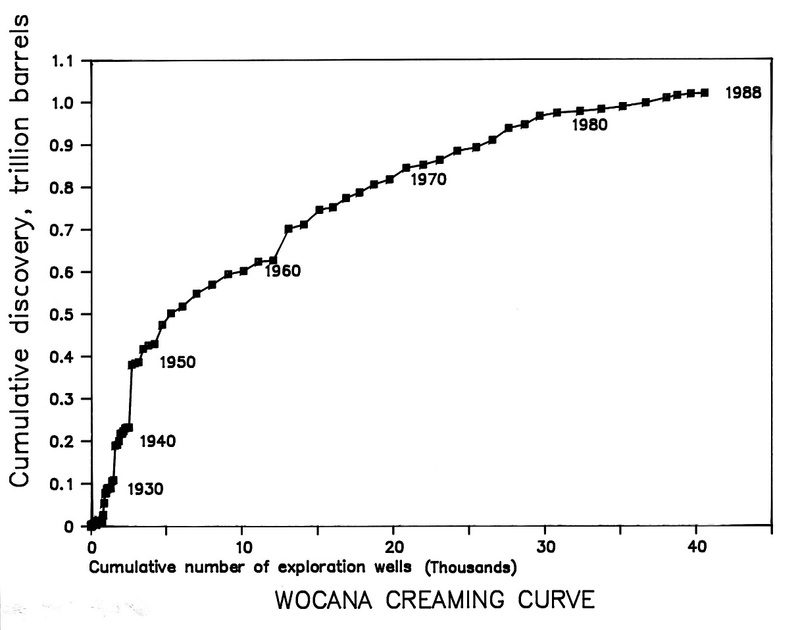 To show this I used the data extracted from the graph to construct a creaming curve of cumulative discovery versus cumulative exploration wells. This shows that the success rate in terms of BOE was high before 1980, and a little less since then, but there is no suggestion at all for a decline in recent decades. A good example to stress the importnace to work with exploration effort instead of years. 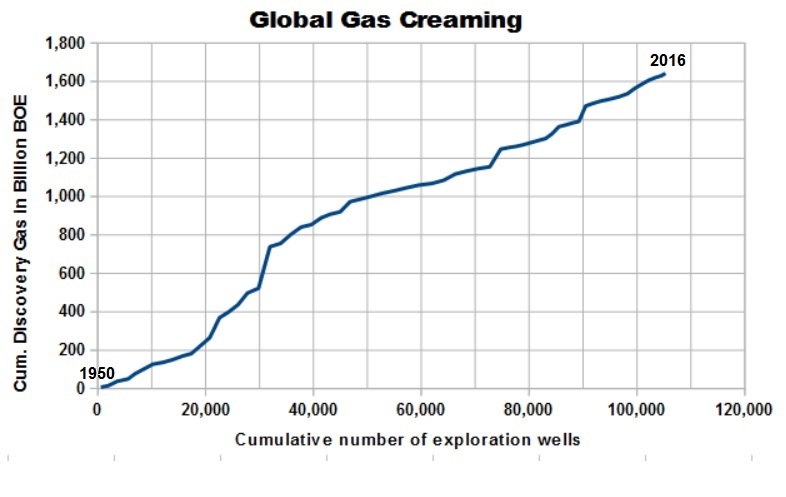 The data allow even a split into the amounts of oil and gas discovery separately, so the oil and gas creaming curves are as shown below. Both show no decline in discovery rate since 1980. An important change is that in this period a significant change occurs from oil to gas as the predominant HC found. 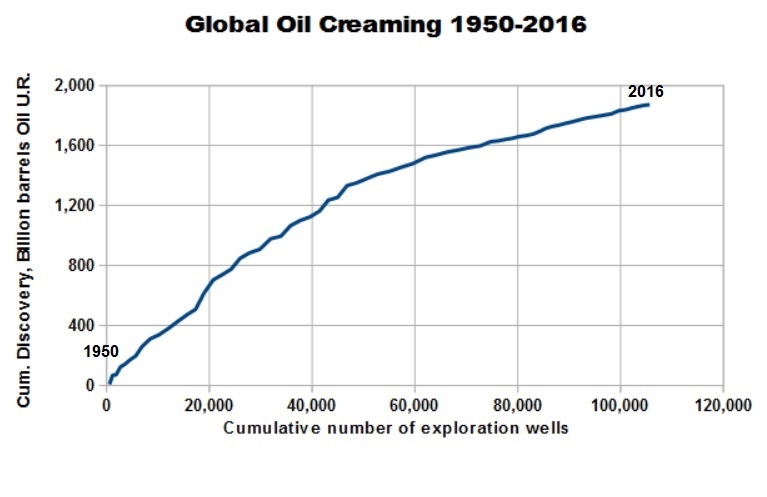 This is shown by the percentage of oil in the HC mix discovered, here against the cumulative number of wells, but a similar picture is obtained if we simply put years at the X-axis. At the country and basin scale there are many examples of the creaming process, a striking example is from Laherre (2006) for Saudi Arabia. This shows that the creaming of the number of discoveries is not present, but rather the reverse, possibly due to improved seismic techniques and the cumulated geological knowledge. But very strong creaming in terms of volumes discovered is observed. Various attempts to make extrapolations for forecasting have been made over the years, e.g. Meisner & Demirmen (1981) have developed a bayesian approach to creaming. I used this for a forecast of UK offshore production made in the early 80ies by UKOOA. Extrapolation of the creaming process allowed a probabilistic estimate of the undiscovered fields. Forman & Hinde (1985) used a log-linear decline function for the discovery rate. Later Forman et al. (1995) further developed their creaming method, involving estimated areas of closure and reserves per area. A new bayesian method was developed by Sinding-Larsen and Jingzhen Xu (2005). Most of the more simple creaming forecasting schemes do not take the areal spread of exploration in time into account. Such "higher dimensional" creaming might improve forecasts. If exploration effort is not randomly spread over an area, but spreads out from a starting point incrementally, it matters if a new wildcat is drilled in the already known area, or in a virgin part of the province. In this way the discovery process may show "sub-creaming curves", a common feature of many creaming curves. Experience with growth of reserves of fields (also called "Appreciation of ultimate recovery") shows that there is considerable appreciation of reserves, at least in the first 6 or 7 years after first production tests. Such growth, or "appreciation of reserves" can be due to the reporting procedures (for instance first only the proven reserves "1P"), the appraisal process, finding other pools in the same field, Better estimation of the drive mechanism, Injection and enhanced recovery implementation. Growth of the Ultimate Recovery is more significant in the early years after discovery than later, although growth may still add to reserves after 30 years or more in some cases. a is a constant close to 1.0 and b < 1.0 and n the year. For a single field, the updates of the UR over the year may present an erratic behavior. More interesting and useful is to obtain data for A set of fields, say 10 or 20. The the UR data and years of the fields are shifted to a common date. The sums of the year columns give the UR history for the total set of fields. These numbers divided by the initial UR are the CGF values. A regression of log(CGF) on Log(year) provides an estimate of the above mentioned constants. Other examples of the revision of Ultimate Recovery estimates are given for UK and Norway by Hermanrud et al. (1996), Dromgoole et al. (1997) and Chengliu et al. (2014). An excellent and readily available paper is by Crovelli and Schmoker (1998) and a good source for further reading. Significant growth means that a reserves creaming needs correction to the last, say ten years, otherwise the creaming process will severely underestimate the undiscovered reserves as well. However, the advances in seismic techniques and coverage by 3D have made the initial estimates for the more recent fields much less biased. The definition of the province, basin, or play that is analysed is very important. Each subdivision may have its own creaming curve. For instance, technical limitations have prevented deepwater exploration in earlier days. Also maximum depth of exploration plays a role. Then gradually prolific areas become available later, partly because of technical reasons. Especially creaming against a time scale rather than against number of exploration wells would become unreliable. So, areas for creaming have to be defined carefully on the basis of both geological and technical grounds. When a play has n prospects, each with its own ,POS, it is fairly easy to obtain a distribution of the number of successes if we drill all the prospects. The procedure uses the binomial distribution not with a single fixed probability, but the various POS values for the prospects. For n < 14 it is possible to enumerate all possible permutations and extract the distribution of numbers of discoveries. The logic becomes clear if we use an example of only 3 prospects. Then the number of possibilities is 2^3 = 8 (and , in general 2^n). The 8 possible combinations are listed in the 8 rows in the left three columns of the table. The last two columns show the resulting number of discoveries for each cobination and the probability that a combination will occur. The probabilities are derived by multiplication ( this assumes independence of the prospects). For instance, In the first permutation, only prospect 1 is a success (indicated by a "1"). The probability of this result from three prospects drilled is p1 * (1- p2) * (1 - p3) = 0.35 * (1 - 0.12) * (1 - 0.55) = 0.2574. For larger n an approximation based on the normal distribution can be used, then based on the average of the prospect probabilities. This analysis of probabilities also plays a role in hindsight analysis of prospect appraisals.